Gold will meet head winds as the world continues to hedge most of its uncertainty with flights to the USD. Unless that uncertainty abates, it must in the end spread all the way to the US. This will happen regardless of what you think of Trump's policies. Trump may accelerate or slow the inevitable. But Government can only slow or speed up market clearing events. They cannot stop them. The worst currencies in 2017 are telegraphing this to us. And those currencies are the tip of a political spear that is reacting to rotting global markets. If the global marketplace were a patient: Turkey's Lira, the GBP, and Mexican Peso are the first symptoms of a major disease. 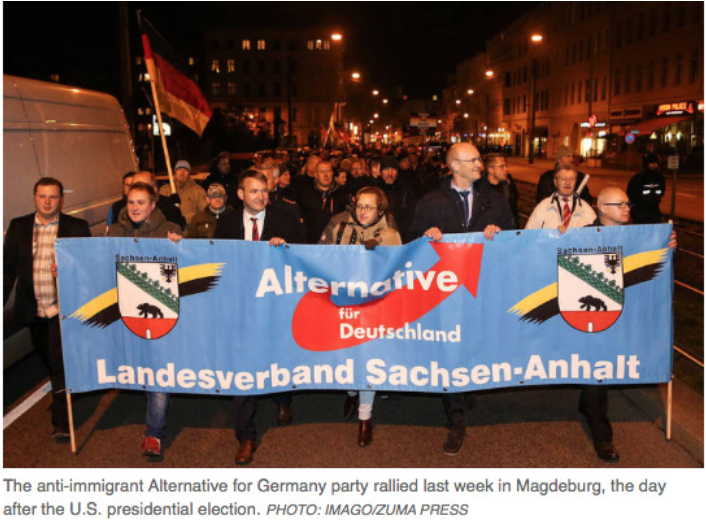 Growing political uncertainty is a manifestation of backlash against current global dogmatic policies. Whether they manifest in Multicultural globalism, Monetary Unions, or Trade Pacts; the roots are the same. Global centralizers are ideologues who think they know what is best for everyone. And those unelected Supranationals will continue to ignore the grass roots backlash growing in all areas of the world. And it will eat them alive if they don't wake up. The truth is ONE SIZE DOES NOT FIT ALL, whether that be in trade, monetary policy, or immigration crises. World leaders will learn that the hard way. The Global/Elitist hedge is to leave poor countries (emerging markets), and the west's citizens (via inflation) holding the USD bag in the end. There is little you can do except start definancializing your assets. Here is how we think it plays out. How fast it happens noone knows. World's Worst Currencies are the Tip of the Iceberg: The world's three worst currencies are showing that politics are driving markets everywhere. This will not change any time soon. The Mexican Peso, Turkish Lira, and British Pound are examples of this in the worst way. But they are only the most obvious examples. The cause of flight out of most currencies and into the USD is a function of political uncertainty. The Euro, Yuan and Yen also are feeling the fallout of politics, but not as obviously as in the 3 worst above show. The USD Benefits More Than Gold Now: The direct beneficiaries of this are the USD and Gold. The USD has, and will continue to attract more money based on its use in trade and greater liquidity. But as we have said many times, all paper money will circle the drain. The USD will just be last to do so. This is because its past performance as a safe haven will attract shelter seekers once again. Long USD Will Be the Biggest Spoof Ever: And once the world has loaded up on dollars, there will be nothing left to go to when the Fed aggressively debases our currency to increase inflation and decrease our debt burden. We have been saying this for about a year now. Timing is not easy as central banks can levitate markets for quite a long time. But we are coming to the end of King Dollar's reign. Keep your Speculative Powder Dry: The best thing to do is continue carrying a piece of your assets in Gold and Silver to hedge when (not if) the USD falls. But don't bet you can time the USD fall. Just have an appropriate percentage of your portfolio in non USD denominated assets. Fundamental and technical analysis are valuable tools, whether speculating or trading, but they are tools that are less effective in today’s world than at any other time in history. Some context is important. 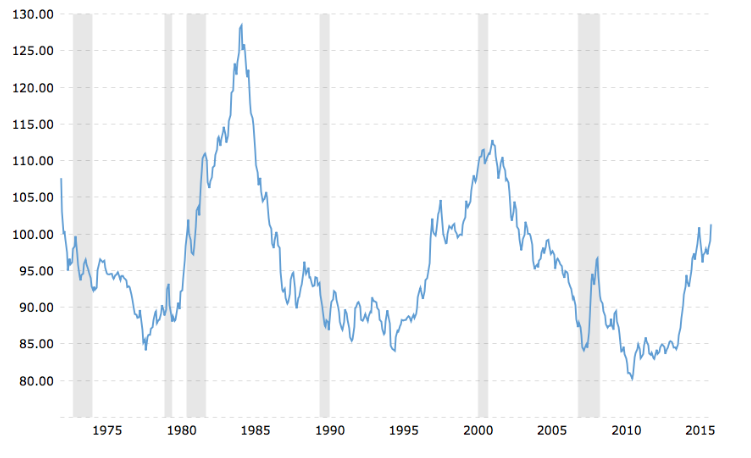 Below is a chart from macrotrends.net of historical data showing the broad price-adjusted U.S. dollar index published by the Federal Reserve. The index is adjusted for the aggregated home inflation rates of all included currencies. The price adjustment is especially important with our Asian and South American trading partners due to their significant inflation episodes of the 80s and 90s.That surging dollar will limit gold’s rise in 2017, but in a best-case scenario that surge happens in the first half of the year and not the second half.